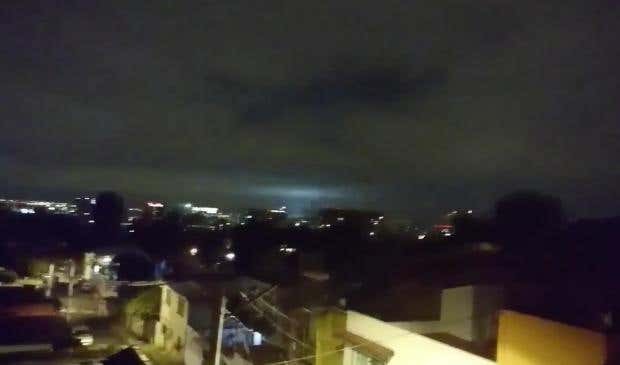 Massive Earthquake 8.1- 8.2 Hits Mexico Triggered by Solar Flare – Coercion Code – "Dark Times are upon us"
A massive magnitude-8.1 earthquake has hit off Mexico’s southern coast, toppling houses in Chiapas state, causing at least 32 deaths and setting off a tsunami warning, officials said. The quake was so strong that it caused buildings to sway violently in Mexico’s capital more than 1,000 kilometres away. 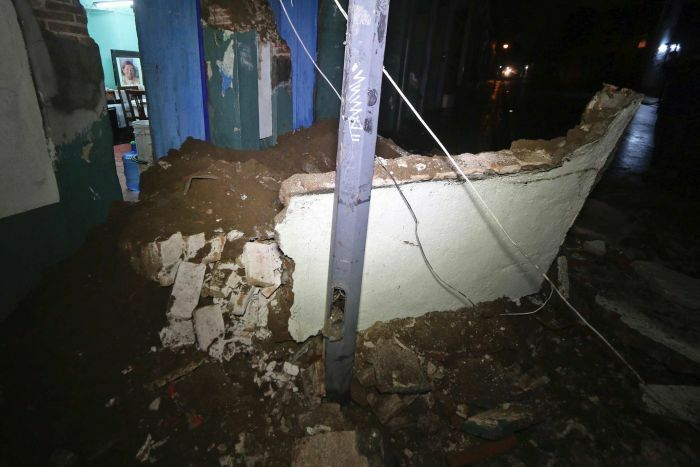 A number of buildings suffered severe damage in parts of southern Mexico. Some of the worst initial reports came from the town of Juchitan in Oaxaca state, where sections of the town hall, a hotel, a bar and other buildings were reduced to rubble. State Governor Alejandro Murat said 23 deaths were registered in Oaxaca, with 17 of them in Juchitan. A spokesman for emergency services said seven people were also confirmed dead in the neighbouring state of Chiapas. Earlier, the Governor of Tabasco, Arturo Nunez, said two children had died in his state. The US Geological Survey (USGS) said the quake struck at 11:49pm on Thursday local time and its epicentre was 165 kilometres west of Tapachula in Chiapas, not far from Guatemala. It had a depth of 69.7 kilometres. Mexico’s President Enrique Pena Nieto said the earthquake measured at 8.2, despite the USGS’s official line, making it “the biggest magnitude to be recorded in our country in at least the last 100 years”. MAP: A map shows the locations of Tabasco, Oaxaca and Chiapas where deaths have been reported. Mr Nieto said 1 million people were initially without power, though electricity had since been restored to 800,000 of them. He said 62 aftershocks followed the quake and it was possible that one as strong as 7.2 could strike in the next 24 hours. The US Tsunami Warning System said hazardous tsunami waves were possible on the Pacific coasts of several Central American countries, including Guatemala, El Salvador, Costa Rica, Nicaragua, Panama and Honduras, within three hours. A tsunami was also confirmed for Mexico, with the largest wave measuring one metre, according to the Pacific Tsunami Warning Centre. The seeds of an earthquake lie in the tectonic plates that make up the Earth’s surface and on which the continents sit. Liliana Villa, 35, was in her apartment when the earthquake struck and she fled to the street. “It felt horrible, and I thought, ‘This is going to fall’,” she said. “I had never been anywhere where the earth moved so much,” said Luis Carlos Briceno, 31, an architect who was visiting Mexico City. “There is damage to hospitals that have lost energy,” he said. Tabasco Governor Arturo Nunez said two children had died in his state. One of them was killed when a wall collapsed, and the other was a baby who died in a children’s hospital that lost electricity, cutting off the infant’s ventilator. “We have reports of some damage and the death of one person, even though we still don’t have details,” Mr Morales said. He said the unconfirmed death occurred in San Marcos state near the border with Mexico. Mexico’s civil protection agency said it was the strongest earthquake to hit the capital since a devastating 1985 tremor that flattened swathes of Mexico City and killed thousands. Authorities in New Zealand are assessing whether the quake could generate a tsunami along the country’s coastline. 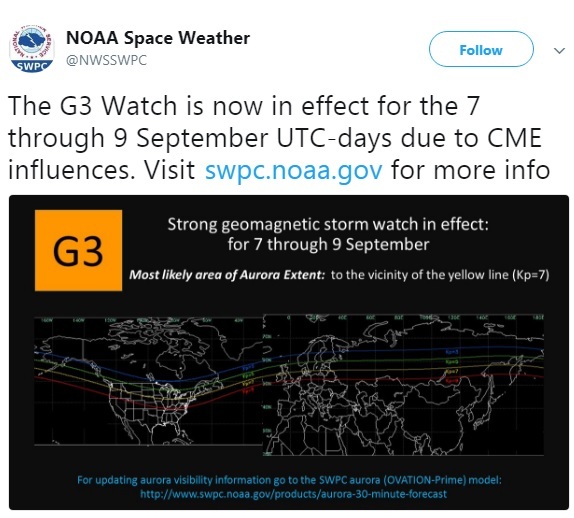 The NOAA updated G3 storm warning to extend from September 7th through the 9th. Solar activity, as indicated by sunspots, radio noise and geomagnetic indices, plays a significant but by no means exclusive role in the triggering of earthquakes. Maximum quake frequency occurs at times of moderately high and fluctuating solar activity. Terrestrial solar flare effects which are the actual coupling mechanisms which trigger quakes appear to be either abrupt accelerations in the earth’s angular velocity or surges of telluric currents in the earth’s crust. In recent research, carried by The Space and Science Research Center in Florida, US, showed strong correlation between solar activity and the largest earthquakes and volcanic eruptions within the continental united states and other regions around the world. The study looked at the data of volcanic activity between (1650 – 2009) and seismic (earthquakes) activity between (1700 – 2009) and then the recorded data was compared with the sunspots record (solar activity). The results of this study showed very strong correlation between solar activity and the largest seismic and volcanic events, within the continental US and globally. The correlation for volcanic activity was bigger than (> 80%) and for the largest earthquakes was (100% of the top 7 most powerful) versus solar activity lows. Additionally, the research concluded the existence of a strong correlation between global volcanic activity among the largest of classes of eruptions and solar activity lows. With the 80.6% occurrence of large scale global volcanic eruptions taking place (> VEI 5) during solar activity lows and with 87.5% occurring for the very largest (> VEI 6) eruptions during major solar minimums. A paper entitled: Explosive Volcanic Eruptions Triggered by Cosmic Ray: Volcano as a Bubble Chamber. The research was conducted by Japanese scientists led by Toshikazu Ebisuzaki. They studied the relationship between solar magnetic activity and 11 explosive eruptions from silicate-rich volcanoes in Japan over the past 306 years. They found that 9 of the eruptions occurred during solar minimum (inactive phase of solar activity). In 2008 researchers, at NASA, announced that close link between electrical disturbances on the edge of our atmosphere and impending quakes on the ground below has been found. This finding is in agreement with similar studies carried out by other space research institutes. Satellites have picked up disturbances 100 – 600 km above areas that have later been hit by earthquakes. Fluctuation in the density of electrons and other electrically-charged particles in the ionosphere has been observed, and huge signal has been detected many times before large magnitude earthquakes strike. Jann-Yeng Liu, from the center for space and remote sensing research in Chung-Li, Taiwan added support to the link between earthquake and disturbances in the ionosphere. He examined over 100 earthquakes with magnitude 5.0 and larger in and around Taiwan over several decades. Based on, the data analysis almost all the earthquakes down to a depth of about 35 Km were preceded by distinct electrical disturbances in the ionosphere. Minoru Freund from NASA Ames Research Center, developed a theory based on the above observations. “It boils down to the idea that when rocks are compressed-as when tectonic plates shift-they act like batteries, producing electric currents”. see the following paper, Air ionization at rock surfaces and pre-earthquake signals. NASA researchers assume that compressed rocks release electrical charges which travel upwards into the ionosphere. In reality, however, the opposite is true- the reverse is happening. Fluctuations of cosmic-solar radiations are charging the ionosphere. That results in anomalies of geomagnetic field which causes the generation of eddy current. The eddy current heats the rocks in the faults and consequently the shear resistant intensity and the static friction limit of the rocks would decrease. This is the main process that trigger earthquakes and volcanic eruption. During solar minimum high energy cosmic radiation can penetrate to a very deep distance below the Earth’s surface, in some case a few hundred kilometers. This is the reason why most if not all earthquakes during solar minimum are deep earthquakes. The stress on the Magnetosphere during solar minimum is higher because the Heliosphere is weaker and more high energy charged particles can penetrate the solar system. On the average, the flux of cosmic rays is 20% higher during solar minimum. But, if the Sun, is in its highest position in the galaxy-which is also the time when the Earth would be in its final phase of magnetic field reversal-then the impact of cosmic radiation on both the Heliosphere and Magnetosphere is higher even during solar maximum. At that position the Heliosphere is at its weakest state due to a very intense bombardment from high energy radiations. Nevertheless, the relationship between the lowest-highest solar cycles and earthquake-volcanic eruption, is supported by an overwhelming evidence. Statistical data show strong correlation between major volcanic activity (based on cubic kilometers of ejected matter), major earthquakes of 8.0 magnitude or more (on Richter scale) and strong solar minimum (grand minimums). In the last two and half centuries the following major volcanic eruptions occurred during strong solar minimum (Grand minimums): Grimvotn (Iceland) 1783/84 (14 km3), Tambora (Indonesia) 1810 (150 km3), Krakatoa 1883 (5.0 km3), Santa Maria (Guatemala) 1902 (4.8 km3), Novarupta (Alaska) 1912 (3.4 km3). The only major eruption to occur during a solar maximum was Pinatabo (Philippines) 1991 (between 6 and 16 km3). A similar correlation was also found for earthquakes. All major earthquakes occurred during strong solar minimums or grand minimums. For instance, after solar activity declined significantly between 2004-2010. There were 11 major earthquakes over 8.0 magnitude. Solomon Islands -8.1(April 2004), Sumatra-Andaman&Indian Ocean tsunami- 9.2 (December 2004), Nias (Indonesia) -8.6 (March 2005), Tonga- 8.0 (May 2006), Kiril Islands (Russia) twice- 8.1 (November 2006 &January 2007), Peru-8.0 (August 2007), Sumatra-8.5 (September 2007), Samoa-8.1 (September 2009), Maule (Chile)-8.8 (February 2010). Scientists are puzzled and cannot give rational explanation why destructive earthquakes took place on grand minimums. Wrong explanation has been given by some Russian scientists. They believe that reduced magnetic pressure on Earth during solar minimum enables tectonic plates to move a little more freely and that would make the release of built up frictional forces between them much easier. But, the magnetic pressure during solar minimum is increasing not decreasing. The stronger is the solar minimum the higher is the magnetic pressure. This is a fact and it has already been observed. Sensors onboard the US Air Force C∕NOFS satellites have recorded a record collapse of the ionosphere caused by the extreme solar minimum. The bottom line is that all earthquakes and volcanic eruptions-big or small- are triggered by an external pressure induced on Earth’s magnetic field. Strong Coronal Mass Ejection Flare directed at Earth can exert pressure, that deform and shrink the Magnetosphere by as much as 4 Earth Radius (4Re). But, the pressure would affect or impact the layers of Earth below its surface in different ways. It depends on the tectonic of each region. In some regions the tension would cause energy to be released in a form of earthquake, while in others it would be in a form of volcanic eruption. On the other hand, very intense magnetic radiation like the one from ultra-dense tiny Stars- the so-called Magnetars– close to the galactic core of our galaxy similar to the one that triggered the December 26, 2004 Indonesian earthquake can induce substantial damage to the Magnetosphere. Such an intense radiation can easily penetrate the Magnetosphere, especially during an extreme solar minimum. This energetic event would increase the flux of high energy particles in the ionosphere to several orders of magnitude. The December 26, 2004 Indonesian earthquake was ten times stronger than any other earthquake during the previous 25 years, and was followed just 44.6 hours later on December 27th by the detection of a very intense gamma ray burst, which was 100 fold brighter than any other in the previous 25 year history of gamma ray observation. This gamma ray burst was released from a tiny star located about 10 degrees northeast of the galactic center. Its size is only 20 km in diameter, but it has a mass around 150 solar masses and a luminosity 40 million times that of the Sun. It releases more energy in a tenth of a second than what the Sun emits in 100,000 years. These kinds of stars can only be formed in the dense regions of the Universe, where the intensity of magnetic fields are so enormous. Current physics called them Neutron stars, but this is a myth just like the myth of Black Holes. Neutron Stars do not exist. Finally, there is a well known phenomena associated mainly with large magnitude earthquakes and intense volcanic eruptions. This distinctive feature shows the lack of understanding the real cause of earthquakes and volcanic eruptions. It is called earthquake light. It has been observed since the ancient times. It is unusual luminous aerial phenomenon that appears in the sky at or near areas of tectonic stress, seismic activity, or volcanic eruptions. In the last a few years seismologists started to take the earthquake light seriously and consider it worth scientific research. Some theories have been proposed, but they do not provide an explanation of the real cause of this phenomenon. This observed phenomenon is yet another evidence that shows earthquakes and volcanic eruption happen as a result of stress induced on Earth’s magnetic field which begins at the ionosphere. Therefore, the development of a detecting system to observe the electromagnetic disturbances, can be established with satellite network system. An early warning integrated system at the ionosphere is extremely crucial requirement for the prediction of earthquakes and volcanic eruptions. It is high time to understand that our planet is permanently linked to the cosmos. All interactions and energetic events on cosmological scales affect or impact our planet in one way or another. Energetic events that take place within our galaxy can influence the solar system within a very short period of time. The physics of isolationism and self sufficient, which is based partially on the misunderstanding of the force of gravity, and partially on the discrete notion of the probability theory of quantum mechanics, in addition to the theories of relativity (special&general) are the most serious obstacles that do not allow us to understand our unified Universe. The Universe exists as a coherent entity. It is absolutely unified by the magnetic force, which is permanently present in the building blocks of matter. For this reason, we are not isolated from events that take place on any scale. But, of course the impact of the energetic events are determined by the distance and the intensity of those events. A strong blast of a supernova or Gamma Ray Burst from the dense regions of our galaxy can shake the entire solar system. And the impact of such energetic explosions would be felt instantly since magnetic fields are continuous. The notion of limited speed of propagation of an energetic event, dictated by the so-called speed of light had and continues to have a devastating consequences on the development of physics. In the last few decades, we have observed so many cosmological phenomena that clearly showed the flaws of this theoretical concept. But, in spite of these observations that are increasing with every new generations of space telescopes and other detecting and observing instruments, both on land and in space physicists refuse to even question the notion of limited speed of light. In fact, the opposite is taking place, these observations are enforced into this theoretical concept, by inventing new theoretical assumptions, like the invention of an imaginary particle, new exotic matter or mystery substance that cannot be detected or observed. Without revising the force of gravity and accepting it as an attractive weak magnetic force that operates between adjacent magnetic fields when the difference in strengths between them is big (or rather not zero) and without discarding the metaphysics and pseudo physics theories of the 20th century, real progress is impossible. In addition to the distortion of the physical reality of the Universe, the theoretical physics of the 20th century did not have any practical benefits to mankind. There are so many claims of course that GPS works on the principle of special relativity and transistor is the result of Quantum Mechanics (QM), and quantum computer (QC) would be built etc. In reality, however, these claims are scientifically groundless. On the other hand, if we can one day go back to the drawing board and revise the force of gravity and discard the myths of the 20th century physics, then surely we can produce the most ideal energy source and be able to manufacture technologies that will allow us to explore the Universe in ways beyond the imagination of science fiction writers.